“The Heydar Aliyev Center, pictured in today’s doodle, sets itself in contrast to the block-like structures that surround it in Baku, Azerbaijan. At the same time, this cultural center takes inspiration from historic Islamic designs found in calligraphy and geometric patterns to create something entirely new. The building takes an open form to invite the public into its space. The center has played host to modern art by Andy Warhol and Tony Cragg, and world-class performances from Kitaro and Alessandro Safina. 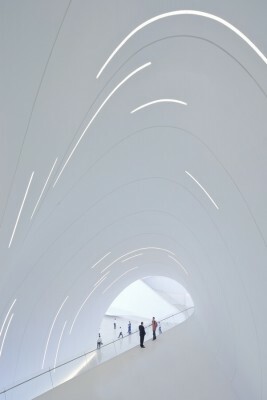 The Heydar Aliyev Center is shortlisted for the RIBA International Prize. 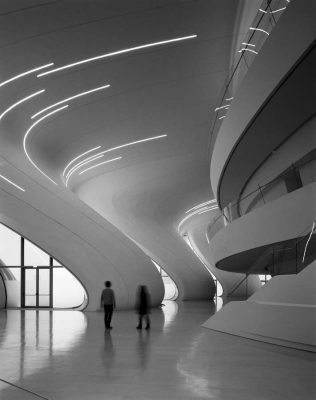 Built on the site of a Soviet munitions factory, the Heydar Aliyev Centre’s fluid architecture embodies an enlightened philosophical framework. Breaking from rigid and often monumental Soviet architecture that is so prevalent in Baku, its open forms promise to open and engage Azeri culture with an act of attraction rather than imposition. The centre’s fluid exterior surfaces rise from its surroundings to define a series of exhibition and performance spaces within, inviting the urban fabric of the city into the heart of building. For the first time this year Designs of the Year included a Social Vote – an opportunity for design lovers from all over the world to vote for their favourite nominated design through the exhibition’s online Social Vote platform. Over 18,000 people took part and the final winner was Phonebloks, designed by Dave Hakkens. 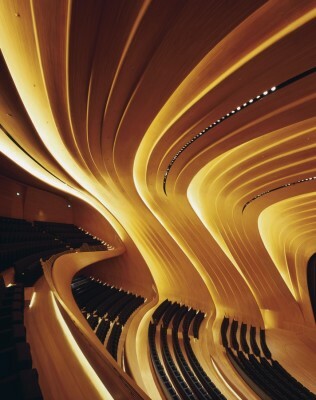 Baku’s Heydar Aliyev Center is a national symbol for Azerbaijan, a catalyst for regeneration, and, in the broadest sense, a regional showpiece. 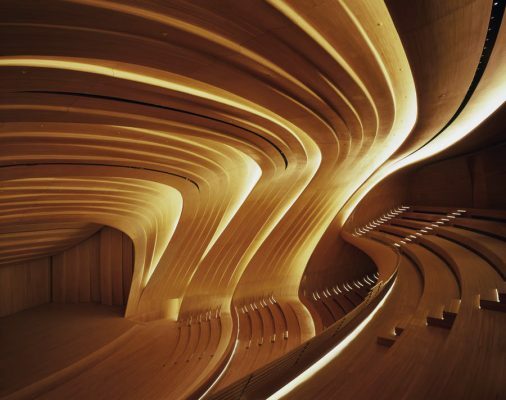 Constructing Zaha Hadid Architects’ audacious design for the Center has drawn on expertise from Turkey, the United Arab Emirates, and the Commonwealth of Independent States, as well as further afield. This explains the feel-good factor and can-do mentality which have made it possible. It is a labor of love. The narrative which follows touches on some of the principles and innovations examined elsewhere in this book: the uncompromising architectural vision, unbridled geometric inventiveness, attention to detail, and resourceful engineering which, according to project architect Saffet Kaya Bekiroglu, involved constructing mock-ups of practically everything to evaluate appearance as well as performance; the contractors’ and engineers’ quest for faster, lighter, more buildable answers to problems posed by irregular, nonrectilinear geometry and large column-free spaces — and the project team’s acquiescence to an approach which was emphatically led not by engineering, but by architecture. Baku is only one of many settings for this narrative, which begins on a site in the capital with challenging ground conditions and traversed by a sheer drop. 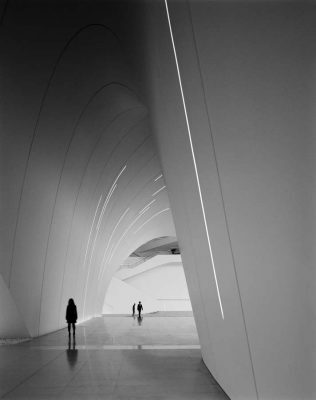 The focus soon shifts to London, where, having been commissioned, Zaha Hadid Architects develop the scheme design, working with consulting engineer AKT, now AKTII, and lighting consultant MBLD, both located nearby. The architects explore the panelization geometry of the internal and external skin and develop the predominantly hard landscape, which benefits from the ironing out of the sheer drop, resolved by locating some of the car parking below ground, but outside the building’s footprint, to avoid security breaches. The architects’ long-term collaborator AKT develops the roof structure design, with trusses spanning between supports within the perimeter envelope and concrete sheer walls. In Stuttgart, engineering consultancy Werner Sobek, initially appointed by design-build contractor DiA as facade consultant, assists with the technical design of critical areas such as the external cladding and its support structure, along with the curtain walling. Recommending space frame construction for the external envelope to assuage DiA’s concerns about cost, Werner Sobek sees the scope of their appointment expand. They are ultimately involved in many aspects of the project, including the space frame, the internal skin, the Pond Cafe at the site’s south end, and the structural glass balustrades, taking on various responsibilities, including design, specification, documentation, monitoring, and supervision, with up to 20 staff involved. Bavarian construction specialist MERO-TSK is awarded the contract for the space frame, weighing 2,500 tons less than the structure originally proposed, and the Turkish firm Bilim Makina later installs it in nine months, which reflects its extent and complexity: MERO-TSK space frames are typically installed in six months. The space frame’s blue paint finish became a Baku landmark, until it was eventually concealed by the Center’s external cladding, and Bavarian specialist Lindner’s internal skin. The glass curtain walls, supplied by Hueck Hartmann, were installed by a Turkish firm. These specialists faced similar challenges of reconciling complex geometry with demands for quick erection, live and dead loads, and material expansion and contraction, working with a defiantly nonmodular design. The building has a single-movement joint separating concrete slabs, space frames, and other components into two sections. In addition, expansion and contraction of finishing materials, such as the external and internal skin, are visually suppressed or absorbed into uniform, if not always regular, panel joints and the extent of off-site fabrication is maximized to optimize quality control and precision. Nevertheless, elaborate interstitial secondary support structures are needed so the inner and outer skins can be set out accurately at their interface with the space frame. This involves labor-intensive site work, for example to fine-tune the fixing positions for the plates supporting the inner skin panels, many of which also need to be bent on site. Our focus now shifts to the United Arab Emirates, where cladding manufacturer Arabian Profile develops the design of the fiberglass reinforced concrete panels for the plaza and the external envelope rain screen. Extruded panels have fiberglass embedded in their concrete matrix in three layers: the top and bottom with undirected, scattered fibers and the ones in between with bundles following the proposed form. With no steel reinforcement, panels can be slimmed down to 8–13 mm without losing their flexural strength. Arabian Profile floats the idea of making the rain screen panels, which outnumber those in the plaza by 4:1, out of hollow fiberglass reinforced plastic instead, halving production times and trimming 80 percent of their weight. This passes muster with the project team, but Arabian Profile must demonstrate that the plastic panels can match the performance and appearance of their micaceous concrete siblings. Next, microchips are fitted to all 16,150 panels, so each can be traced, dramatically accelerating installation. Before all this has happened, Arabian Profile contracts London digital panelization specialist Newtecnic to develop 3D software. Next to Turkey, where Sanset İkoor are exploring options to fabricate the auditorium interior, working with Ankara acoustic specialist Mezzo Studyo. As more and more specialists in the region join the project, the Heydar Aliyev Center begins to rise from the ground and take shape, a conical concrete core sprouts up and is garlanded with steel flooring platforms, intriguing steel boot columns are craned in, then decking units—some to be bent on site before their waterproof membranes are welded together. Rain screen panels are bolted onto brackets before the wind can carry them away, access modules walk up the stairs and, after the structural balustrades are fitted, the services and plaza lighting are tested and commissioned in preparation for the Center’s opening. MERO double-curved space frame structure supporting solid external and internal envelope: MERO KK system (Fabricated by MERO-TSK Germany) made of solid steel ball nodes and CHS members. Nodes with diameter between 110 and 350 mm and up to 16 threaded holes in different directions. Due to double-curved geometry all nodes and members are different and individually produced. Members with diameter from 60.3 to 273 mm automatically prefabricated of steel cones, CHS pipes, threaded bolts and sleeves, up to 4.5 m long. All node and tube connections assembled on site without any welding. To achieve high corrosion protection all parts are galvanized and coated in accordance with DIN EN ISO 12944. All Items are under strict MERO quality control in accordance with DIN ISO 9001 and ISO 14001. Additional framing construction: In situ concrete sheer walls and floors, steel floors. Solid external skin: Fiberglass reinforced polyester rain screen cladding panels to roof higher than datum at approximately 3 m above ground level. Arabian Profile. Color match with off-white fiberglass reinforced concrete panels achieved by using a gelcoat layer with special mixture for visible faces. Sheen, sparkle, and texture to match fiberglass reinforced concrete panels. 120 mm returns on all edges. 50 mm wide primary joints between panels, allowing access to fixings, with 15 mm wide transverse joints. Support structure for external skin panels: Curved primary transverse steel tubes with rod connections to space frame. Secondary longitudinal steel tubes spanning between primaries and supporting rain screen panels. Weatherproofing: Prefabricated trays comprising U-profile purlins fixed to space frame stools supporting trapezoidal metal decks supporting rigid insulation boards with weatherproof membranes above and self-adhesive vapor barriers below. Roof drainage: Weirs in weatherproofing below roof rain screen discharging into downpipes. Access and maintenance system: Solid external envelope: cherry pickers, safety point hooks in 50 mm gaps between panels at approx. 3 m centers, with rappelling strategy for steepest surfaces. Glass curtain walling: Unitized structurally bonded fixed glazing with split mullions and transoms, adaptor frames, and vertical cover profiles. Suspension points at tops of units. Insulating glass units with combined solar-control coating and low-e coating on the outer panes. Inner and outer panes contain fully tempered safety glass. Outer pane: laminated glass with polyvinyl butyral laminate, either standard PVB laminate for medium acoustic requirements or with noise-control foil. 2-pane insulated glass units comprise laminated glass with 2 panes 6 mm tempered glass externally. Glass heat soak tested to EN 14179, combined solar-control coating and low-e coating on face 2. 16 mm air cavity with highly insulating spacer, stainless steel spacer, or comparable. 8 mm tempered glass to inside heat soak tested to EN 14179. U-value to vertical units ≤ 1.4 W/m2K. 114 Percentages are allowed to vary up to 2 percentage points in the adverse direction. Acoustic insulation: max. Rcwtr = 41 dB required for glazing. The insulated glass units allow and guarantee for a deflection of the glass panel edge of up to L /150 (approx. 25 mm over a length of 4 m). Deflection in the middle of panes with supports along all edges not limited to a certain value. Structural silicone seals to inner and outer panes of insulating glass units. Curved glass panels around museum / tunnel elevation: tempered outer pane, with enamel frit at the edges to cover the spacer bonding, with bendable and temperable solar-control coating. Curved glass IGUs to match surrounding flat glass units perfectly. Plaza flooring and panels in transitional zone between plaza flooring and raincreen: Flat, single- and double-curved fiberglass reinforced concrete flooring panels by Arabian Profile. Specially developed alkali-resistant fiberglass and cement sand mortar. Slip resistance: R10 in wet conditions, R12 in dry. Panels rest on concrete and gravel in plaza and wedge-shaped concrete footing in transitional zone. Gaskets in joints to prevent finger trapping and indicate proximity of transitional zone between plaza and external envelope. External ponds: top and bottom reservoir with perimeter overflow requiring accurate workmanship to stonework at edges and special collector unit to ensure water appears still, waterfalls connecting reservoirs have concealed channels at supply and overflow points to prevent them disturbing still surfaces of ponds and have dedicated filtration; special vacuum and filtration appliances for maintenance and cleaning of shallow reservoirs. Landscape and hardscape walls: board-marked in situ concrete. Grass: blend of 3 different seeds suitable for windy, hot, humid climate, terrace garden plant system comprising drainage layer, and root retainers with automatic garden irrigation system also available. Ground-embedded facade lighting fixtures: produced by the Light Project company, can be directed by 360 degrees, with special filter. Bespoke fixtures with reflectors, used in facade cove: produced by British Crescent Company. Recessed LEDs at sides of the steps: bespoke item by Cedetas with linear stainless steel casing and top-radiused Flotel glass. Stone light marker LEDs: manufactured by HRN design. 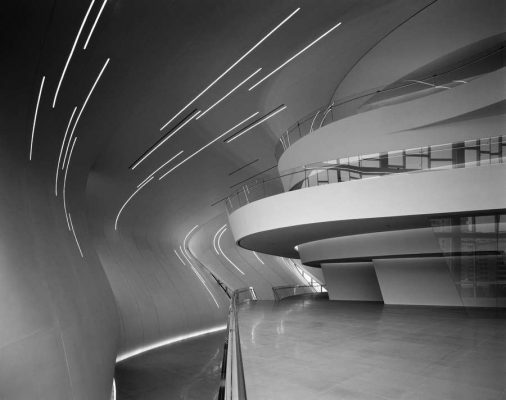 LED fixtures below stair railings: bespoke design by Zaha Hadid, manufactured by Zumtobel. Inner face of external envelope: 6 mm Flex-Panels. Skimmed and painted. Panels and boards screwed to fixing plates connected to telescopic tubes connected to tubular secondary steel support structure suspended from space frame, with threaded rod bracing where required. Suspended ceilings: Knauf Acoustic suspended ceilings: Baswa Finish to auditorium ceiling and walls: Oak Internal flooring Transitional zones between internal floors and walls: Bolidt synthetic resin flooring. First-floor exhibition area in museum and grand stair on first floor: Greton branded beige artificial stone, size: 45 × 90 cm. Atrium lobby: lighting integrated into helical stair handrail; balustrade uplight adjacent to step; recessed light features in ceiling; floor slot fittings uplighting external skin. Auditorium: linear wall washers; dark recessed ceiling slots conceal downlighting onto seating areas; step lighting; ceiling shadow gap wall washers providing ambient light. Structural cantilever glass balustrades and handrails 1,100 mm high tempered and laminated extra clear glass. Structural glass balustrades to stairs and landings, but not galleries, with LED luminaires, bus bars integrated with laminated glass. Stainless steel handrails to stairs and landings with wall-fixed LED luminaires. Fresh air is supplied to all mechanical rooms. Variable air volume system for exhibition gallery. Control of drafts from large areas of facade glazing by convectors and floor heating. Heating and cooling plant located in remote utility structure. Smoke control: special pressurization systems prevent the spread of smoke into the escape staircases in case of fire. 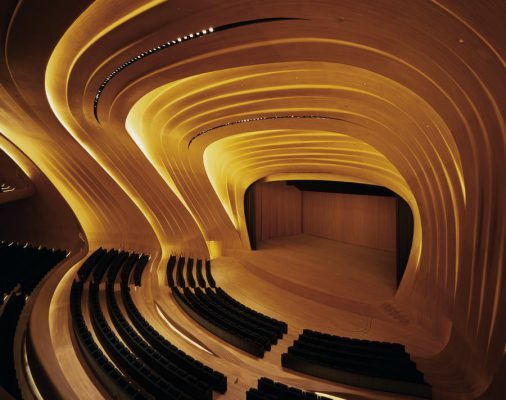 The latest major building by ZHA, a cultural centre in the oil-rich state of Azerbaijan.